"Polperro, a spectacular few miles along the coast from Looe (also a CB pencil sketch). Sheltered from the ravages of time and tide in its cliff ravine, it's an enchanting jumble of cottages, each one unmistakably the work of a Cornish fisherman." 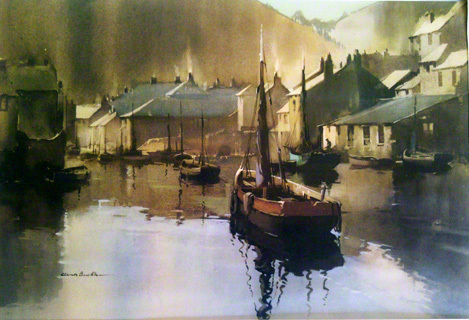 Claude Buckle manages to capture this Cornish fishing village with a spectacular water colour painting showing the harbour filled with fishing boats and other boats moored alongside jetties adjacent to the waterside Cornish fishing cottages. We are looking for the original painting. If you have any information please click here. Picture courtesy Michael Chavez. Created in 1971. 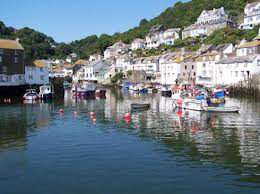 Photograph of Polperro 2013 showing the harbour from the same angle as the painting above.